Everyone has a secret superpower, and I am no different. Some people are wonderful dancers. Some people can catch anything that is thrown at them. Some people can multiply large sums in their heads. And me? I can clear a 3-foot radius around me in about 10-15 minutes without even trying. When I tell people about this, they shake their heads and think, She’s at it again. Exaggerating her uselessness. But they’re not around to see it. I can guarantee that, if I sit on one side of a room before yoga class, everyone else will try to sit on the other side. At a large dining table, if no one is assigning seats and no one really knows me very well, one or both chairs to either side of me will remain empty. I have even had people switch seats at a movie theater in Thailand — where there is assigned seating — to move to an empty seat further away from me. I don’t know if it’s my smell or what. It certainly isn’t something I do on purpose. And it is almost never useful. It’s just something that happens, more often than not. Sometimes. Just sometimes. Other times I have to go into the whole rigamarole of how I moved to the States when I was a baby and came back and blah blah blah blah. It is the penalty that life exacts for speaking such terrible Thai. So it is no surprise when I find myself with a spare 10 minutes in Chiang Rai (the town of my birth) and head over to Sai Oua Pa Nong (San Kong Noi Road, across from Chetupon Temple, 082-760-4813) for what a few locals said were the best sai oua (Northern Thai sausages) in town. That is hard for me to believe because 1.) the best Northern Thai cook I know is my Aunt Priew, who lives in Chiang Rai and 2.) I make my own sai oua too, and it is not bad. It might even be good, if you are my friend and you just spent an entire afternoon making sausages with me. The minute I get there and ask for “50 baht of sausage” in Thai, the man in front waiting for his own sausage order to be grilled narrows his eyes at me. “Where are you from?” he says, and I’m still thinking if I should choose “Filipino” or “Japanese” when a sprightly little old lady carrying what looks like 1000 baht worth of sausages looks up at me and grins. “Can I just get a little bit of this sausage?” I say. “I just want one or two bites,” and she says “Certainly!” with a great big smile. “And what’s this?” I ask, pointing at a bunch of small plastic baggies filled with a thick green liquid. I run over the rest of the menu with her, asking for recommendations and whatnot and it’s only when she turns to leave do I realize that this lady is a freaking customer and I’ve been running my mouth at the wrong person for something like 10 minutes. “The smallest order of sausages for takeaway is 150 baht,” says a 20something man behind the counter. “Do you work here?” I ask. He may or he may not, but he throws in the vegetable juice chili dip for free, just so I can try it out. 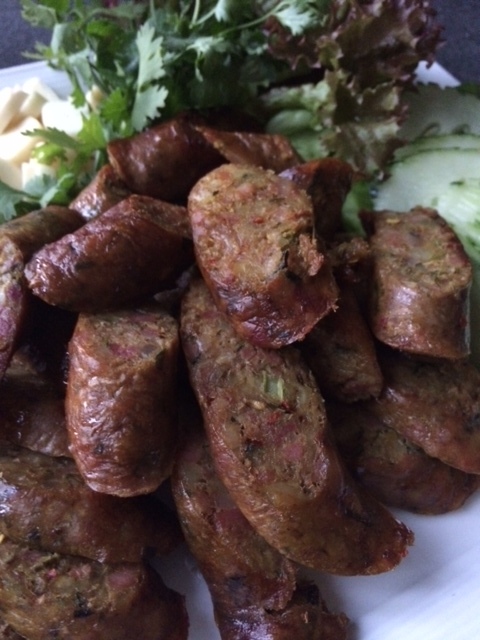 It turns out the sausages are thick, closely-packed and meaty, peppered liberally with big melting chunks of pig fat. They taste like they’re supposed to, salty and herbal but with a generous kick of chili spice, so I get why people like them. The real revelation, though, is the chili dip, which is fibrous and green, yes, tasting just like Claussen dill pickle juice. I love it.